Quickly charges your laptop with boosted energy efficiency by up to 10% on average. It boasts a lightweight travel size as well. 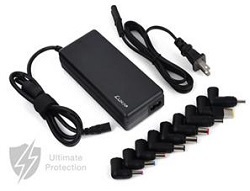 It includes 9 interchangeable DC output controlled tips to support majority of brands: ACER, ASUS, COMPAQ, DELL, DELTA, GATEWAY, HP, IBM, LENOVO, NEC, TOSHIBA, Ultrabook. High Quality UL Certified Power Cord: Extreme quality, performance and reliability. Positions your mobile device to record video or capture images of objects, textbooks, or documents.